Sunday afternoons are the place to be if you are 13 and under! Sunday afternoons are THE place to be if you are 13 and under! We have two different aged groups. 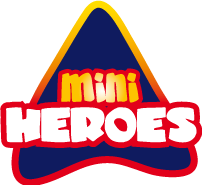 Mini Heroes is for our children from 1 to Reception. They get to hang out, play with toys, learn from the Bible and begin to understand about faith in Jesus in a very caring and nurturing environment. GCK is for years 1 – 6. (Years 7 & 8 are young leaders in this group, too). This group is fun, relevant, often noisy and is designed to equip our kids to love Jesus and change the world around them. All our GCK servers are DBS checked and a copy of our safeguarding policy is available in the resources page.